So how do you keep Pasover when on a river cruise in France? It took some advance planning. This is a common issue, as we travel during Ellen’s spring break, which always coincides with Passover. So I do a virtual Seder in my head, knowing why this night is different than all other nights. First, I had 2 days of our trip before Passover started. Not that you can gorge on baguettes enough for a week in 2 days, but it was nice to start on bread. With just a carryon-sized suitcase, I still decided to bring things with me, so we wouldn’t have to traipse around looking for matzah. 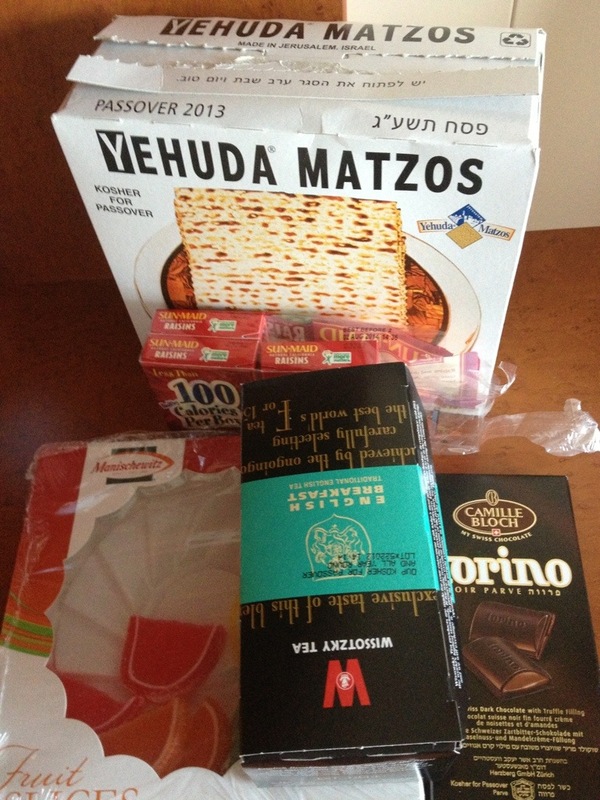 So I brought a pound of matzah, boxes of raisins, 3 chocolate bars, 4 granola-type bars, gummy bears, the candy gel fruit slices and a box of tea bags, all kosher for Passover. So yes, I’ll have room in my suitcase going home. I usually keep Passover fairly strictly, but that isn’t quite possible when eating out. So I’m avoiding bread, but not worrying so much that there may be corn products in sauces, yogurt or the like. I actually doubt the French adulterate food like we do. So I bring some things to nosh on when we are out, bring my box of matzah to breakfast and lunch, and avoid anything bread-ish as best I can. It’s why we haven’t made it to Italy, because that would just be cruel to not eat pizza and pasta there. But otherwise, it works. This entry was posted on Friday, March 29th, 2013 at 11:04 am	and tagged with France, Jewish, Passover and posted in France. You can follow any responses to this entry through the RSS 2.0 feed.